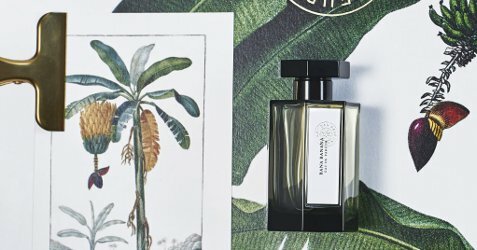 L’Artisan Parfumeur will launch Bana Banana this month. Bana Banana was inspired by an unreleased Jean Laporte fragrance from the 1970s (a friend had asked him to make the fragrance to wear along with a banana costume). Bana Banana was developed by perfumer Céline Ellena. The notes include peppercorn, nutmeg flower, violet leaf, jasmine, banana flower, tonka bean, iris, musk and amber. L’Artisan Parfumeur Bana Banana will be available in 100 ml Eau de Parfum. Interesting. The notes sound a bit like PG’s Felanilla. I love Felanilla but hope this is nothing like! Can’t tell if you’re kidding — if they listed banana, would not mean there were bananas in the perfume. There may or may not be banana flowers either. Also no ylang, though I agree with the banana undertone in jasmine. There is clearly some miscommunication here. I think we’re misunderstanding each other…if you make a cherry perfume and you list cherry as a note, it does not mean there is any real cherry in the perfume, right? If you say cherry blossom instead, you could be using the exact same accord or synthetic that you used if you called it cherry. It doesn’t really matter because lists of notes are not the same as lists of ingredients, and they’re never complete. They are created for PR. They might change even when the fragrance doesn’t change, and vice versa, for marketing reasons. So in this case they’re implying they’ve made a perfume that smells like banana. It is possible somebody made an extraction from banana flower, but it’s more likely that’s a fantasy note. You could build a banana accord entirely from molecular fractions of florals, or with other synthetic materials, and you could call it “banana” or “banana flower” with equal levels of deception. Seriously doubt there is any natural extract from “nutmeg flower” in there either, and it’s probable there’s no real “iris”, and we know there’s nothing that is “amber”, it’s probable there are a whole bunch more notes that they are NOT listing even though they used them. I now see what you thought I was saying. In fact, my point was that they didn’t list a banana note or accord. I did not expect them to put actual banana (or banana flower) in it. I did expect them to say one of the notes smells like banana. I’d like to think that no one thinks a cherry blossom accord smells anything like a cherry accord, as they smell completely different. Similarly, surely no one is pretending that neroli accord smells like orange. I’m thinking they are using “banana flower” as the stand in, and that didn’t strike me as noteworthy — I fully expect any list of notes to be a PR construction of what they think you need to know. But also, I have not smelled it — maybe it won’t even smell like banana! This sounds like fun. I remember Penhaligon’s Amaranthine (discontinued) had a banana note that was quite nice, and Jean Patou has one, Sira des Indes, I think, that’s very pretty. Sira des Indes was very banana-y, as are many ylang-heavy fragrances. Hoping this one is going for something more fruity, like the banana equivalent of Ananas Fizz! And a banana perfume sounds like something The Body Shop would do. I hope the banana note (if any) isn’t too faint. L’Artisan is a venerable perfume house, so they might make it an esoteric banana perfume, not a fun, trashy one. That description made me laugh out loud! I’m dying to try this. I tried that Blackbird banana scent the other day and while it was fun, not particularly wearable. I wonder if I could get down with it true banana scent. I have been trying to find my sample of that Blackbird for DAYS. Wish I could help! My threshold for wearable is very high, and I did appreciate the fun in it. I just can’t imagine wearing it for a whole day. More like a laugh before bed.